Kate Ulrich Saracene advises fully and self-insured employers, consultants, insurance brokers, third-party administrators and multiple employer associations regarding employee benefit plan design and operational compliance. She has extensive experience with a variety of plan types, including health, life and accident, flexible spending accounts (FSAs), health reimbursement arrangements (HRAs), dependent care assistance programs, and severance pay, among others. She also provides counsel on wellness programs and paid family leave, two of the fastest-growing areas in employee benefits. 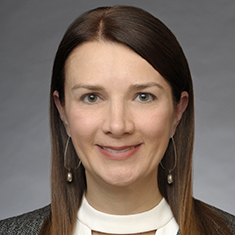 In addition to developing benefits strategies and drafting plan documentation and notices, Kate helps clients navigate the complexities of government disclosures and filings, US Department of Labor and other government audits, and benefit plan litigation. She also represents employers in negotiations involving third-party administrative service agreements and collective bargaining agreements. Additionally, Kate provides counsel on compliance matters to a wide variety of employer types, including education, health care, manufacturing, hospitality, technology, media, government and industry associations. She also has a robust practice advising third-party administrators on product development and compliance. Kate frequently lectures and writes on topics relating to employee benefits and wellness programs, and has been featured in national and industry media, including quotes appearing in Forbes, Bloomberg Business Week, Law360, HR Morning and HR Executive magazine. She has been recognized as a "Rising Star" by Super Lawyers, a "40 Under Forty" award recipient by the Rochester Business Journal, a "Top Woman in Law" by The Daily Record, and a "Woman to Watch" by the Democrat & Chronicle. Prior to joining Katten, Kate headed a number of human resources functions at Xerox. She most recently served as the head of the Health and Welfare Benefits team at an Am Law 100 firm, where she also practiced as an employment law attorney. Shown below is a selection of Kate’s engagements.